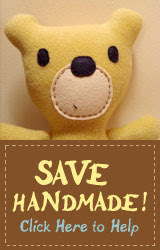 My Little Patch of Sunshine: Save Handmade Goods for Children! On February 10, 2009, the Consumer Product Safety Improvement Act will go into effect. If it goes into effect as currently written, untold numbers of artisans and small businesses will be forced out of business due to the forced testing of each item that is used in the creation of handmade goods for children. Third party testing of each item used in the creation of wooden toys, handmade dolls, baby slings, and anything that may be used by a child -- will cost thousands of dollars. The cost of testing will force most (if not all) individuals and small businesses who create items for children out of business. I would hate to see this happen! We have always heard how small businesses are the backbone of our economy, and this act will effectively shut down untold numbers of small businesses. If a small business manages to pay the testing fees, they will have to charge that much more for their items, and will likely limit the number of items they sell. One mama I know who makes baby slings determined that she would have to test each different fabric and each different ring to comply with this act. The testing for her current inventory would cost more than $3000.00. If she wanted to add more fabrics, or different rings, that testing cost would increase. She would have to double the cost of her slings to meet these new requirements, and would have to borrow money to test the current items in her inventory. If this act goes into effect, she will go out of business. Cool Mom Picks has an extremely informative post about this act, and gives information about a few different things we can do to prevent this act from going into effect. Please click over there and read the information they've put together. I know everyone is busy with the holidays right now, but please take a moment to let your representatives in Washington know that this act is not good for American businesses or consumers. Don't put them out of business! !